Welcome to Day 2 of the Bloody Valentine Blog Hop with Smeared and Smudged - More from Smeared Ink. Just to answer some queries, I'm working on getting Blogger Comments back on and removing the Google+ comments... will be as quick as we can! In the meantime, we appreciate the visits and I'm so sorry if you cant leave a comment - perhaps you would visit today's LOC Crew member Rachel and leave some love on her blog! 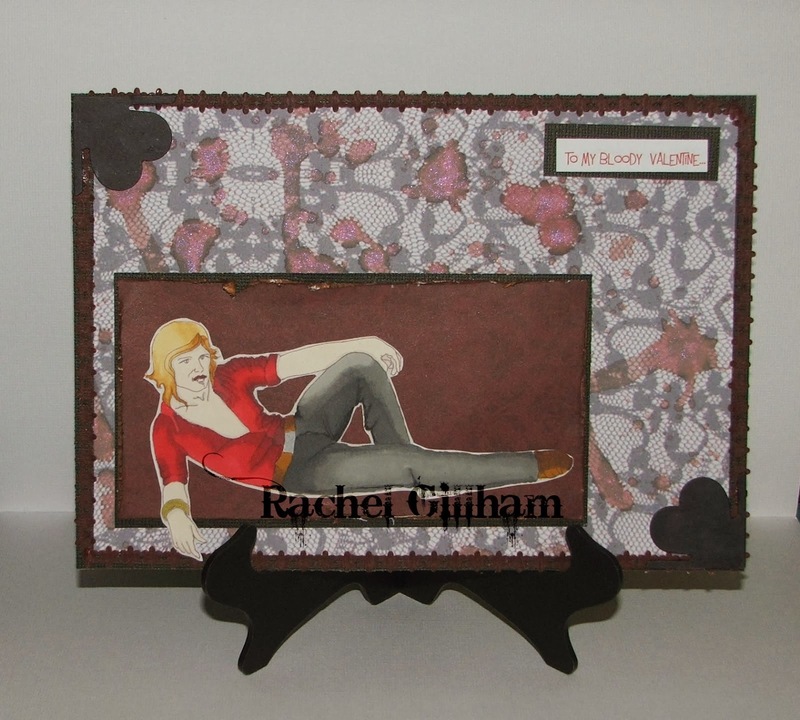 Rachel has created a card using a digi stamp called Demon Lover from one of our other LOC Crew members - Eiglas! You can find her fabulous Digi Store here. For this piece, I chose Eiglas's demon lover . He was coloured in promarkers and for the background he is against I used part of a Gorjuss A4 paper , distressed , inked then matted on black coredinations. Behind that is a piece of lace paper that was a free digital download, with blood splats and drips created by putting pink food colouring in a misting bottle, depressing the lever , removing tube and nozzle then letting go of the button. there are purple shimmers in the blood too, because the previous inhabitant of the bottle had been some purple mica . that paper is edged by self adhesive lace flowers coloured to a dark burgandy with one of my promarkers, two black heart die cut corners and another piece of black coredinations card. A fabulous card Rachel - thank you! Thanks for joining us! See you tomorrow! Love your card...wonderful colouring using the promarkers! I thought I'd give it another try, I really wanted to leave a message. I love this image, the colours, everything. What a great card Rachel. Love how you colored the stamp, your layout and the sentiment. Awesome card, he's so handsome, great colouring! Cool image and I love the blood stained lace!